I have been working at this for months. 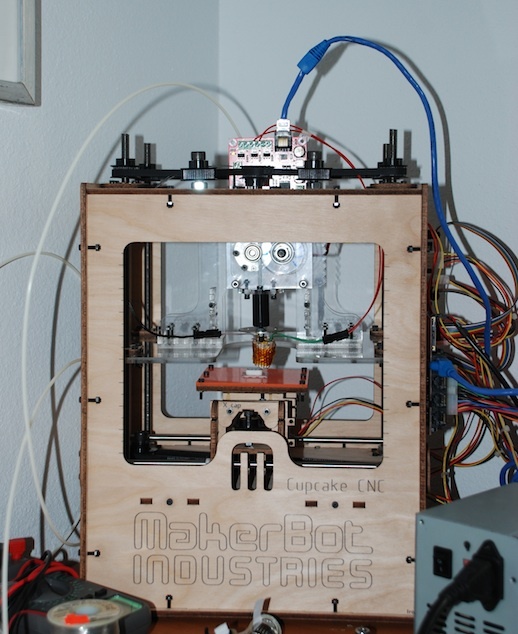 A couple of years ago, I found out about the RepRap project. The idea behind the reprap (if you haven’t talked to me recently) is to create 3-dimensional objects on a computer, and produce them in reality by “printing” them. Today, I printed my first object. After months of struggling with various different solutions trying to make this work, I gave in and bought a Makerbot Cupcake. It’s a 3D printer. I got that a couple of weeks ago and struggled again with some design problems that I didn’t anticipate. With some help from the people in the #reprap IRC channel and a better heater from MakerGear.com, I finished up the extruder (the part that melts plastic) and this evening I printed my first piece ever. I’m super-excited and I had to share. My first piece was a very not-exciting 15mm cube. In response to a friend’s question, this is essentially the “Hello World” of the Open-source 3D printer movement. So there it is. My first printed plastic object. The lattice thing there is called a ‘raft’. It’s meant to help the object cool down properly, so there aren’t warping problems. Anyway, If you have questions, thoughts, etc. Let me know! So is the extruder which comes with the MakerBot not sufficient? I’ll have two print some invaders. 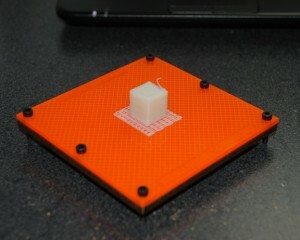 I just barely finished repairing my heated print bed, and it’d on it’s first-second trial run. We’ll see how it goes. As for the makerbot extruder, we have become mortal enemies. I ended up buying some components from another company and they worked like a charm. The design has a lot of flaws in it. The one that comes to first to mind is the thermal barrier. This is the thing that keeps the extremely hot barrel and nozzle from melting the device it’s attached to. 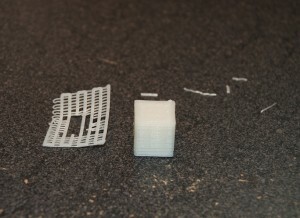 Makerbot supplies one made out of teflon (PTFE), and teflon is a very soft material. What happened to me (on two teflon barriers) is the barrel wasn’t screwed in tight enough (because it’s so soft, you don’t want to screw it in too tight, or you damage it) and hot plastic got in there and made it impossible to use. The barrier I used is PEEK, it’s tougher. It worked beautifully the first time. The alternative option I used was just so much smoother that I’ve nearly sworn off makerbot alltogether. Crazy. They should have a bug tracker, given that it’s open source and all. I mean, a wiki is fine, but this seems like an honest defect in design. Yeah. I think a bug tracker could help, but the nature of it makes it more difficult. Since this is reality instead of simply code, a lot more goes into a simple problem. 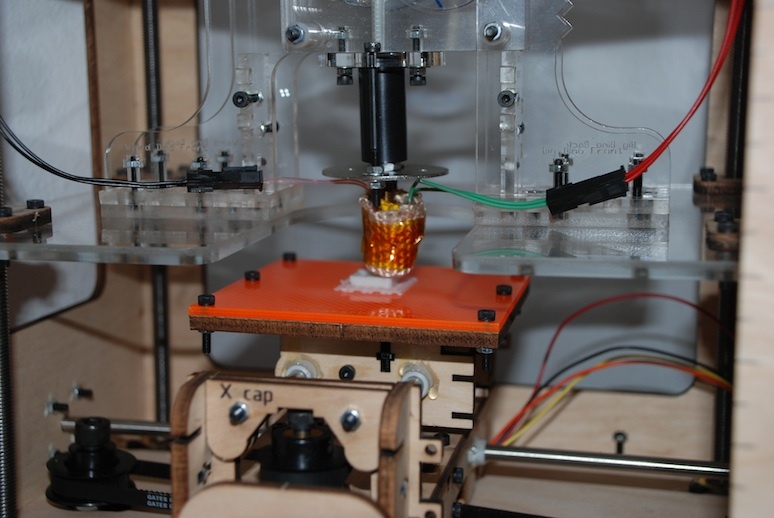 If your extruder isn’t working, it might be the thermal barrier isn’t set right, or not screwed on tight enough, or the heater’s not heating up high enough, or the nozzle is clogged. The list really goes on. A bug tracker I think would be difficult given the nature of the beast. It is a bit of a defective design. I get the feeling though that Makerbot has 10,000 of these in their warehouse and doesn’t want to offer a better solution until they’ve sold these off. That’s just a guess though.